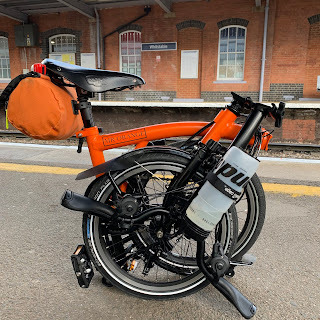 My Orange Brompton: Tweed Run- Am I In? The Tweed Run is an excellent bicycle event that is great fun and well organised. It has become an important part of the cycling calendar. The premise is simple. Ladies and gentlemen of all ages and backgrounds meet at a location in London dressed in their finest tweeds and often on vintage bicycles. It is quite a sight to witness but to take part is magical. A few weeks ago I entered into a lottery to gain a place on the Tweed Run. The money raised from the sale if these tickets (£2000 raised so far) went to the excellent cycling organisation CTC. The lottery closed Friday just before midnight and the agonising wait began. I thought it might be a week or so but the people at the Tweed Run managed to inform lottery winners yesterday evening. I was very pleased to discover that I had got through. This really made my day and I am still pleased about it now! The Tweed Run takes place in a few weeks time and I will have to dust off the little tweed I have and perhaps add a few items to my wardrobe. At the moment I am like a small child excited and looking forward to perhaps opening Christmas or birthday presents. Whatever the weather I suspect this will be a great event and I can't wait! !